We know we’re lucky. This nomadic adventure is not a life that most people can live. But access to this kind of life is just the beginning. It takes a lot of luck, hard work, and an ability to overcome your doubts about yourself and your decisions. The time for us to make those decisions came only a few months ago when this kind of lifestyle was just an Instagram pipe dream for us. We lived in a place we absolutely loved, yet we had a commute to a rat-race job every weekday morning. 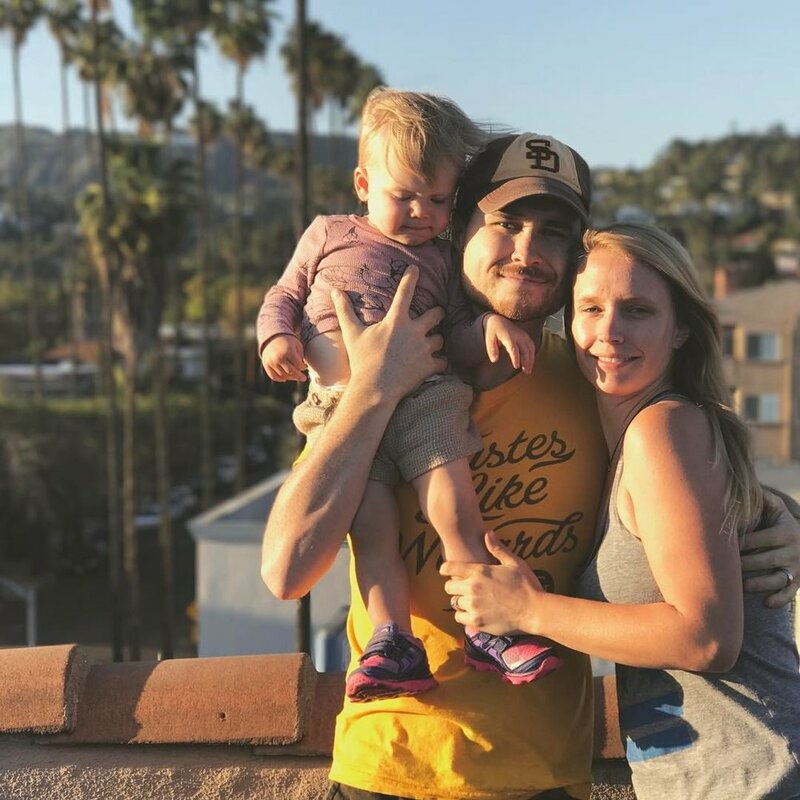 Our infant daughter was the new and exciting light of our lives, but the grind comes along with taking care of a newborn wore us down almost every night. We nearly resigned ourselves to the monotony of the uninspired suburban experience, complete with all the trimmings: the starter house in a safe neighborhood near a good school. It seemed right, but it didn't feel right. Then something amazing happened. I was approached by a friend about a job that didn't require a daily commute and offered me the ability to be around my blossoming family. A remote job. I could work from home. This was an absolute revelation. Chelsea and I leaped for joy knowing that I could be home for all of my daughter's firsts. I wouldn't have to hear about them over the phone, stuck in the 805 traffic. I took the job without hesitation. Now again, let me say that we are extremely lucky and incredibly grateful. This job provided me the opportunity to be a parent to the fullest of my capacities and I will never forget how fortunate I am because of it. It is the third best thing that ever happened to me. Go ahead, ask me what the first two are. So we settled into our new life. Anyone who's been through this knows how it goes. Schedule and repetition rule the day, but the love you experience trumps any doubts you have about the direction your new life is headed. Chelsea and I had everything we ever wanted. And like clockwork, that's when the itch started. What if there was another possibility? What if we didn't have to settle down yet? What follows is our process we followed to get out of our rental house and on the road. We hope it can be a blueprint for how you do it, too. So we were about a year into being parents and our hearts began to wander and our minds began to turn. We were happier than we'd ever been raising Kailen in our little California bungalow. San Diego, and in particular our neighborhood, was the perfect place to raise her. But was it perfect because we felt that way, or was it perfect because that's how everyone else felt about it? What if that Instagram pipe dream wasn't so far out of reach? It was at this point, early in 2017, that we began our scheming. We knew the approach we would take to our new life ahead may be unorthodox. That said, we did NOT expect the upfront workload to be so daunting. We immediately discovered that there is a very fine line to walk when planning a fairy tale, globe-trotting lifestyle. You know, the one you see on your feed every day. And not to mention, making fiscal responsible decisions for your family’s future. One thing is for sure: you have to work hard. I'm a greater believer in luck, and I find the harder I work the more I have of it. Sadly, no trip like this can happen without money. We have the ability to work anywhere there's an internet connection and a quiet space to focus. For someone else, this may mean funding your travels by finding odd jobs along way. And some people have full bank accounts and are already up to their neck in zeroes and commas. Whatever your route to the life unsettled may be, stay focused on your work. It's the key to the whole she-bang. That said, don’t force a gig that isn’t right for you - you will regret it. You may be able to steal away to escape that undesired job for a few hours, but even on an adventure like this, it isn't worth it. You need to know what you’re doing will benefit you in the long run, and burning out will derail everything. The most important ingredients of a great travel experience are flexibility, a positive attitude, and the ability to remain calm. If work is dragging you down, you're going to have a bad time. Figure out the vital needs for your life abroad. We started early, so there was enough time to tackle the million and one things that we needed to prepare for on our journey. Still, we nearly missed critical items on the list. These items could include some things that seem mundane now but are critical for you to make this work. How will your health insurance work in your destination countries? Where will your domestic mail go and who will take care of it? Will you need to get travel insurance to cover your planned activities or any disruption in your schedule? Planning to use public transportation or to rent a car? How will you be able to carry your belongings with you? You may need an international driver's license, too, depending on where you go. You will most likely need a new cell phone plan. The list goes on and on. Start early and be thorough. Thanks to my wife, I have learned nothing bad will come of over planning your new lifestyle. Leave no stone unturned, and once you think you're done, flip those stones over a few more times. As you plan you'll quickly realize that the costs of living like this can nickel and dime you to death. Part of our plan is to save more money whilst exploring the globe. It sounds crazy at first, but when compared to the cost of living in Southern California, it begins to make sense. To accomplish this, we plan to live outside the highly trafficked tourist areas. Removing any frivolous costs we accumulated in the states (I'm looking at you, Netflix) will help us, as well. And above all, we're going to focus on making our life simpler. The joy of prolonged traveling is experiencing what's right around you. It doesn't have to include lobsters, Dom Perignon, and first class tickets. Let your new life and experiences be the joy that drives you, not the things in it. Once you do this, plan for everything to still cost 25% more than you budgeted. It happens with lunch at Chipotle (2 dollars for guacamole??) and billion dollar government projects, so your life will be no different. Start with this in mind and you can take on the fiscal challenges that come your way. Remember when we talked about planning in step 3? Well, it never ends, so keep it going and keep it positive. Double, triple, and quadruple check your flight plan, lodging reservations, and schedule. Don't be afraid to cancel costly legs of your journey if something better comes along. We literally booked our first stay 5 times. Spend what may seem like a ridiculous amount of time on Airbnb, hostel websites, Google Flights, or our personal favorite, Momondo. Use whatever you find useful and wear it out. Do your research and do it often, even if you think something is already planned to a tee. Be thorough and be realistic. Personally, what I'm guilty of is assuming things will be taken care of on the first go. Don't do this: "Oh, we will just take a bus from here to there. It'll be running that day." Nope. Absolutely not. Find out when the bus runs, how reliable it is, and what the holiday schedule looks like. Then research the trains, taxis, and pedicabs. Save your plan, know it, and have it figured out to the nth degree. This may seem tedious and horrible because it is a lot of work. But the best part about Unsettling Down is that it isn't vacation. It's your new life. Unless you're crazy ambitious or without child, you'll be staying for weeks or months at a single location. These transition days won't be back to back, so spend the time to get them right. Don't announce your plans to anyone before you complete them. After reading this are you saying “Wait, what? Don't tell my parents or best friends?” Seriously, don't. You'll create a sense of accomplishment for yourself that will derail your whole operation before it starts. This step may have been the hardest for Chelsea and I to master. How could we hold this kind of excitement inside? This may not be a problem for some people, but it is some of the best advice for making a transition like this one. Honestly, it is just good life advice, too. I've benefitted greatly from this mantra, and can safely say it's made this entire shindig possible. Above all else, you have to trust in yourself. The ability to follow your dreams, uhh I mean plans, requires faith in yourself. I know, I know. It's quite a paradox to say this at the end of an article about bucking the norm. But once you can accept that you're in it, you can find the strength in yourself to make it happen. Follow your instincts. If something seems wrong, it probably is. Everything will cost 25% more than you budgeted. Budget for that. Don't be afraid to redo your work. Nothing is permanent. Take care of your health and don't push it too hard. Rest is key. You're all set, so now comes the hard part... what to do with all your stuff? We sold everything we owned that had no sentimental value. This was the hardest thing for us, especially with the slew of new memories we created with Kailen. I still cringe a bit when thinking about the toys we had to part with to fit everything into the car. There was more to sell than you would think, too. We had 5 yard sales. We were power-users on LetGo and Craigslist for months. After all that we still ended up junking a boatload of items right before we left. So whether you decide to sell, store, or donate your things, remember that they are only things. The experiences and the memories you create will stay with you forever, but those XBOX games and high school sweaters won't. Embrace it, and you'll be better off. If you plan right, you won't have to dream anymore. It remains to be seen if this whole adventure of ours will work out, but that's the fun in it anyway. Hopefully you'll follow along and be inspired to do the same someday. And we’ll be sure to report back on how all our advices pans out.